SYNOPSIS: The historical novelist has a responsibility to make his fiction both meaningful and accurate. 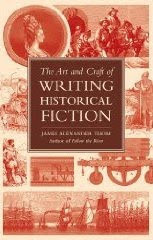 "The Art & Craft of Writing Historical Fiction" offers comprehensive instruction on everything from conducting research to character development and world-building to navigating matters of historical license. Author James Thom instructs readers on how to find and use historical archives; conduct physical and field research; re-create the world of their novel, as the book's characters knew it; and, seamlessly weave historical fact with their own compelling plot ideas. Hmmm is right. I wonder if the book would give me some additional insights, or parrot what I already know. Anyone out there read it? I haven't read it.....don't think I will. This looks like something I'd be very interested in. I don't know much about the subject, but it looks like it could be really helpful for some ideas I've had. I'd be curious to hear what someone who has read it thinks about it.